You can watch the video for the past episode recorded on April 11th, 2019, above, or you can review the transcript below. What is the 14-Day Productivity Foundation Challenge? Alright, we are live. Welcome everybody to episode number 78. And we are going to be covering a lot of really cool stuff today. The first thing I’m going to jump into sorry, dealing with a couple new changes to the setup here, we’re going to jump into an update about automating Gmail to to do it and some things you can do with your managing multiple Gmail accounts. So for those of us who maybe have a personal Gmail account, and then have like a G Suite account, or you know anything like that, there’s some things you can do to make that smoother and save yourself some time. So some good stuff there. Also want to tell you a little bit about the 14 day productivity foundation challenges coming up. 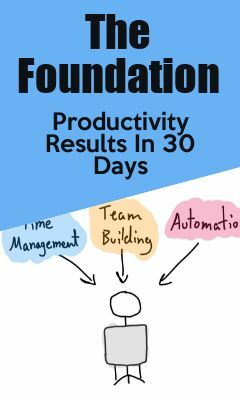 If you want to just skip straight to finding out more about that you can go to productivity dot Academy slash foundation challenge, that’ll take you right there. Alright, so real quick, if you’re watching live, you can always ask questions, I’ll be checking back and forth as we go. as time allows, I’ll get to those if you’re not watching live, you can come join us in the productivity the rather than real world productivity group, I can find the link below. And you can always ask questions at productivity dot Academy slash questions. And you can either join us live or ask questions and check out the replay later. All right. And if you’re watching the replay, or you catching this on YouTube, hit the subscribe button stay up to date, as far as the live Q and A’s as well as other content put out around app reviews, automation and time management, all that sort of good stuff. So all right, let’s get into it. The first thing I wanted to talk about was the foundation challenge. And what this is going to be, is a way for you to get back on track if you’ve already got these going or a way to start your kind of productivity Foundation, okay, it’s named after the book I wrote called the foundation. And the idea here is just that I want everyone to have that equal footing in terms of building that foundation, and building it very well. So that you can build whatever you want on top of that. All right. So to use the building analogy, you’re building the foundation, you can build a house on top of it, you could build a skyscraper, you can do whatever you want. And some of the most important parts of these is the daily review. Okay, so that’s the first seven days is going really deep into that as far as each day how you can start set up your daily review, and then how you can kind of tweak, optimize and get the most out of that. So for a lot of us, we are already doing that, or we have some pieces of that. But if you’re already doing it, you might want to go through this just to make sure that you’re catching everything that you’re getting the most out of that if you’re already putting your time into it. And then if you’re not already doing this on a daily basis, this is something that truly is the foundation and can give you some amazing results in as little as a week. Then we to we’re going to add the fuel to the fire with automation, which I always get really excited to talk about. It’s so cool, because you can realize some huge gains right away. Excuse the automation of actually going to go through today is an extension of that. But also on top of just it’s not just you know, follow this through this automation. Yeah, you save time, which will happen, but also knowing what you should automate. I recently talked to Bendel, who’s the founder of missing letter. And he had a really good line when we were talking during the podcast recording. And he said, you know, not everything that can be automated should be automated. And we discussed that a little bit more. And you’ll be able to listen to that in the full podcast episode when that comes out. But it is a good point. And I attack that from the point of view of how do you know what’s the most important thing for you to spend your time automating? Because maybe it’s going to take you 30 minutes or an hour or maybe even two hours to automate something or longer if it’s a really long process bloat. And if you’ve got five things, how do you know which one you should be focusing on. So that’s part of the challenge, and a whole lot more, also, you’ll get a free copy of the foundation book as part of that. So that’s going to be starting April 25. But you can get signed up now, and will notify you when that starts. Now right? Let’s check back over. Alright, so now would be the time let’s go and check out the updates on this cool little automation. So I’m gonna switch monitors. And let’s take a look at this. So we’re inside of Zapier. Now something I wanted to say about this is that, you know, this could be really simple. If you just have one email address, then all you really need is the started email. And the Create task. If you’re using to do it. Again, you could use anything here, if you want to start an email to get in and out of your inbox quickly, then you can have a go to Monday, you could create a task and to do list, anything that Zapier can connect to you could create an as far as where it goes so hugely flexible, it’s a great way to save yourself time from being stuck in your inbox. But for those of us who maybe have several Gmail accounts, like I have a G Suite account, and that’s how I have the productivity.or sorry, productivity Academy, Email Setup. And if I get a multiple automation is like this, Zapier doesn’t really pull. It does, it looks at the email, and in the URL of the email, it looks something like, you know, it’s got the Gmail URL, and then it will say slash you slash zero. And then it’s got some more information as far as like what email it’s looking at. But the problem is, if you have multiple email accounts open, it actually goes slash zero slash one slash are slash sorry. So I actually use the last one. So that’s useless to things like that, for how many are signed into. And so what that means is, when you have more than one account, you could have this go and it’ll run and it’ll go into to do it. But the link will be wrong if you’re trying to link to the email, which is a great way to save yourself time, because it will go to the exact email and even the exact thread in an email chain. But if that URL isn’t right, then it’s going to send you into your primary gmail account, which can be annoying, because it’s literally not taking Can you email so you can still get the notes and get this up, decline and do all that. But unless you do this formatting action, and you’re using multiple accounts, you might not end up where you want to be, which is not really going to save you time, which is kind of the point of this. So let’s see what we can do. All right, so all we add in here is an action and it’s a format or action. So if you had to add this, you would come in here and go into for matter and then select action. I’m going to skip that. And we’re just going to step through and I’ll show you what to do this is a really quick and easy one, we want to select text. And then the text, you want to find them replace values with all I do you select this from step one, and you select the message URL. And as you can see right here, you’ve got that slash you slash zero. All right, and since this isn’t my primary inbox, I want to replace that part with the slash to now you can probably just find the slash zero. But I want to make sure that I’m finding just this part. And I don’t want for example, if it ever started here with a slash zero, I don’t know if it could, but I don’t want to take that chance. So I just replaced the whole part with this. In this case, when I open up the productivity Academy gmail account, that’s what it looks like I have a slash to so I do that I continued and tested and works perfectly. So that’s a great one you can add save yourself some time and make it actually work in case you had this setup. And you’re wondering why had just kept bouncing you back into your main email account. All right, I’m gonna check on questions real quick here. Alright, that looks like is it for today. So thanks for watching. And you again, you can always join us live in the rural productivity group you can watch on the productivity Academy Facebook page, or if you’re watching the replay, you can check it out on YouTube, hit subscribe, stay up to date, and get updates as far as apps productivity, time management, team building automation, all that sort of good stuff. Alright, so this will do it for the week and I’ll see everybody next Thursday.